Rakhine, one of the poorest and most isolated states in Myanmar, is “home” to some 800,000 Rohingya, who surely count as the world’s most persecuted people. 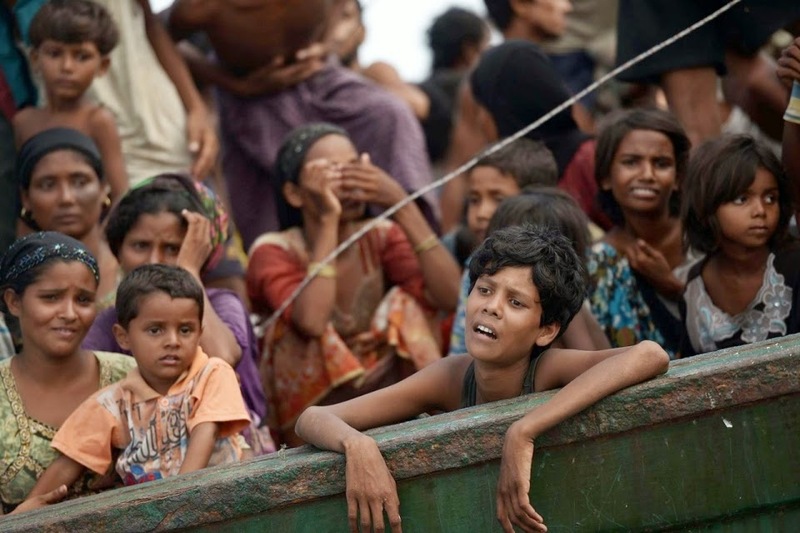 They have remained stateless for decades, with neither home nor citizenship, popping up on the world’s consciousness only when a humanitarian crisis strikes – like the ongoing reality drama of life and death, being played across Southeast Asia seas with boatloads of people stuck adrift after Indonesia, Thailand and Malaysia all took steps to block them from landing on their shores. While Malaysia has grudgingly and informally hosted an estimated 50,000 Rohingya and occasionally and half-heartedly called on Myanmar to cease persecuting them, all these efforts will come to nothing if our government does not step up and help the boatloads of Rohingya from being kicked about like a human football until all of them die in the seas. The Rohingya are denied Myanmar citizenship even though they have lived in Myanmar for generations. They are accorded only “permanent resident” status, with the majority holding a Temporary Registration Certificate instead of the Citizenship Scrutiny Card issued to full citizens. Because the Rohingya are related to the Bengalis of Chittagong, the Myanmar government claim that they are ethnic Bengalis who arrived unchecked from India during British rule, and more recently from Bangladesh. The Rohingya suffer from serious state discrimination and degrading practices unparalleled anywhere else in the world. These include arbitrary arrest and detention, forced labour, arbitrary taxation, extortion, restrictions in civil documentation, travel, marriage and birth, expropriation of property and poor access to health care, education and employment. Historically, they have also suffered tremendously from state violence, most notably in 1978 and 1991-92 when many fled to Bangladesh. After the deadly riots and pogroms of June 2012 in Rakhine which killed hundreds, destroyed whole villages and displaced hundreds of thousands, some 40,000 Rohingya are now living in confined ghettos and camps, a situation that is perhaps best described as a slow genocide. Not surprisingly, today many Rohingya try to flee in order to seek asylum and a better life elsewhere, making the dangerous journey to Thailand, Malaysia or Indonesia. In the first quarter of this year, an estimated 25,000 people have reportedly forced to flee from Myanmar and Bangladesh. It is difficult to understand the origin of Myanmar’s animosity toward the Rohingya, whom the Myanmar consider to be beneath even the kala (foreigners) of Indian origin, who already face considerable discrimination. The simplest explanations are undercurrents of racism and Islamophobia, founded on the Rohingya’s dark skin and Muslim identity in an overwhelmingly Buddhist country. The Rohingya’s general isolation from the mainstream Rakhine and Bamar population is also a contributing factor, but such isolation is not substantially different from that of other minorities who have fractious relations with the Myanmar state but who are not treated with the same level of prejudice. To justify their treatment of the Rohingya, the Myanmar government claim that their policies are aimed at ensuring national security and preventing illegal immigration from Bangladesh. But these are poor explanations as Rakhine, like Myanmar’s other border regions, is populated on both sides of the state line by members of the same ethnic group. For example, ethnic Chin and Naga are also present in India; Kachin, Wa and Shan in China; Karen, Mon and Shan in Thailand. Many of these groups enjoy trade, family ties and relaxed cross-border movement that the Myanmar government have done little to control. Further, Muslim armed resistance has been insignificant since the 1950s, and has never compared with the well-established ethnic armed groups that continue to operate in Kachin, Kayin and Shan states. This is an important point to stress: the idea that the Rohingya crisis could suddenly be resolved within Myanmar cannot be taken seriously. In general, Rohingya groups have been isolated and excluded from multilateral discussions, both within Myanmar and beyond. They have little to no public or political support from any other ethnic group or from Myanmar’s opposition and exile groups, and certainly none from the Rakhine ethnic majority in the state, where deep suspicion and hostility remain. Aung Sang Suu Kyi and the National League for Democracy have been a huge disappointment by doing their best to ignore the Rohingya’s persecution and have failed to return the kindness and generosity the world had shown them when they were then struggling for democracy and freedom under the decades of military rule and repression. Why is the Malaysian government not helping the emaciated, past starving, dehydrated, sickly Rohingya men, women and children who are clearly in dire need of emergency assistance? They have suffered enormous hardship, undertaken a dangerous journey, travelled weeks or months on end in rickety and overcrowded wooden trawlers, just to seek refuge and a better life than the less than zero existence they have in Myanmar and Bangladesh. Hundreds have already perished at sea to reach us. Surely our government’s benevolence and humanitarian assistance policies cannot be premised on the skin colour of the Rohingya. In the past, our government have welcomed Palestinian refugees (and Bosnians) with open arms and supported an aid flotilla to Gaza in 2011 even though they knew the Israelis would never allow the aid to reach its destination. The failure to help the Rohingya at our shores, turning them away at sea is inhumane and cruel, and represents the worst of our collective humanity. It is as good as signing their death warrant on behalf of the Myanmar government, aiding and abetting their genocide, one boatload at a time. This is a major humanitarian crisis that is unfolding right before our very eyes and our government’s failure reeks of hypocrisy, ethnic prejudice and double standards. This disaster will live on in infamy, and forevermore be reminded and mocked each time our government pride Malaysia as a model and moderate nation, never mind an Islamic one. * Eric Paulsen is co-founder and executive director of Lawyers for Liberty.